This is amazing kitchen napkin with extraordinary design. Here cutlery is wrapped into it. 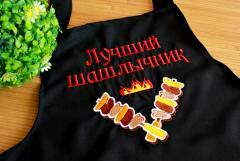 Due to usage of Dreamcatcher wolf embroidery design your meal looks like gourmet dinner in medieval castle. But it is not difficult to repeat this picture at all. It is made with just one color of thread. You can add it by your own monogram as author did.